Most impressive. Obi Wan has taught you well. 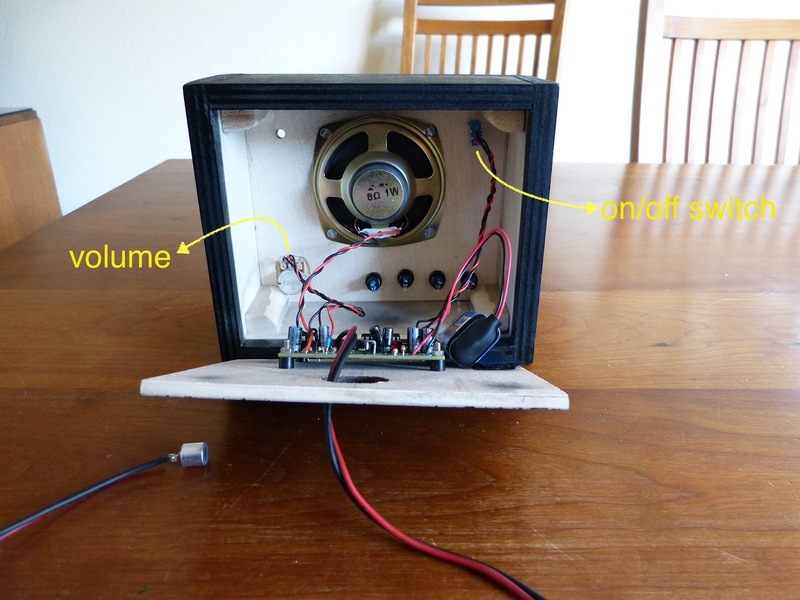 The last couple of weeks I worked on a homemade voice modulator that is easy and cheap to built. First I’d like to mimic the Darth Vader Voice Changer, but with the press of a button it can be changed to robot or helium kind of voice effects. Last week I’ve steadily continued my work. 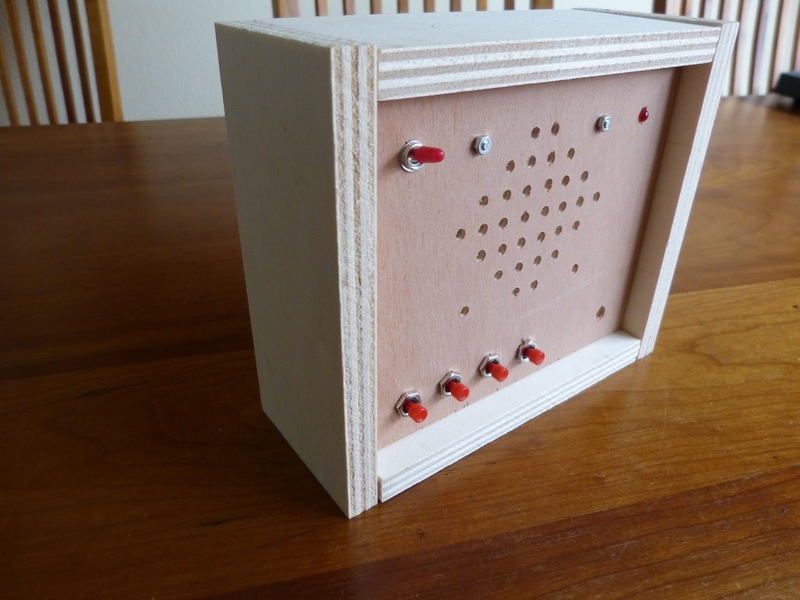 The project has two main parts, the electronics and the case. 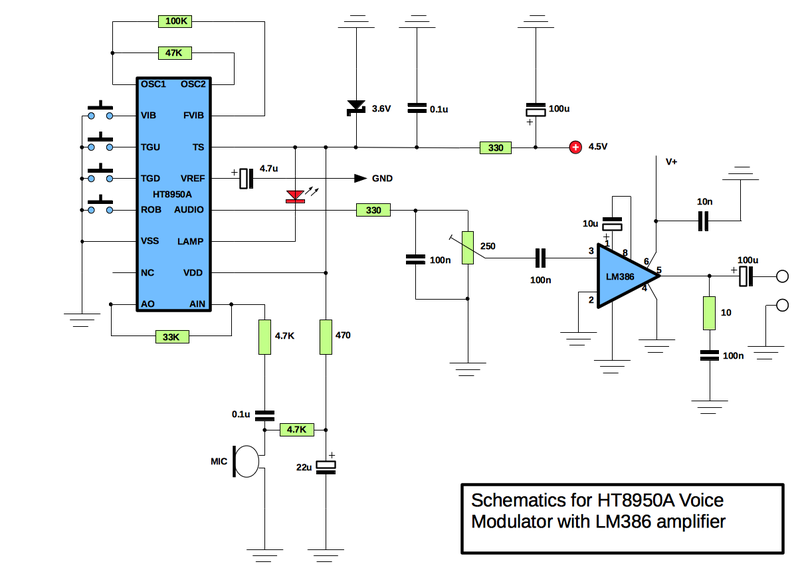 For the project I choose the HT8950A voice modulator from Holtek as the heart of the circuit. It is cheap, versatile and easy to work with. I previously had the voice modulator working. I only had to amplify the signal which seemed simple enough. Well, that turned out to be a bit more troublesome than expected. After connecting the LM386 to the circuit and powering it up an annoying hiss was introduced. After some experimenting I figured that the breadboard was to blame and decided to copy the circuit to another breadboard. Although on the new breadboard the hiss appeared somewhat reduced but it was still at an unacceptable level. Even when I removed the input signal from the LM386 the hiss continued. I connected the HT8950A with a audio-jack to an external amp. I wanted to make sure that the hiss was coming from the LM386. With the external amp the hiss was gone. The fact that I had hiss without an input signal indicated that the supplied voltage wasn’t clean. To clean it up I placed a small capacitor (10nF) from pin 6 (V+) to ground and voila the hiss was gone (see schematics below). It took me some time but I’m almost ready to finish this circuit and solder it to perfboard. 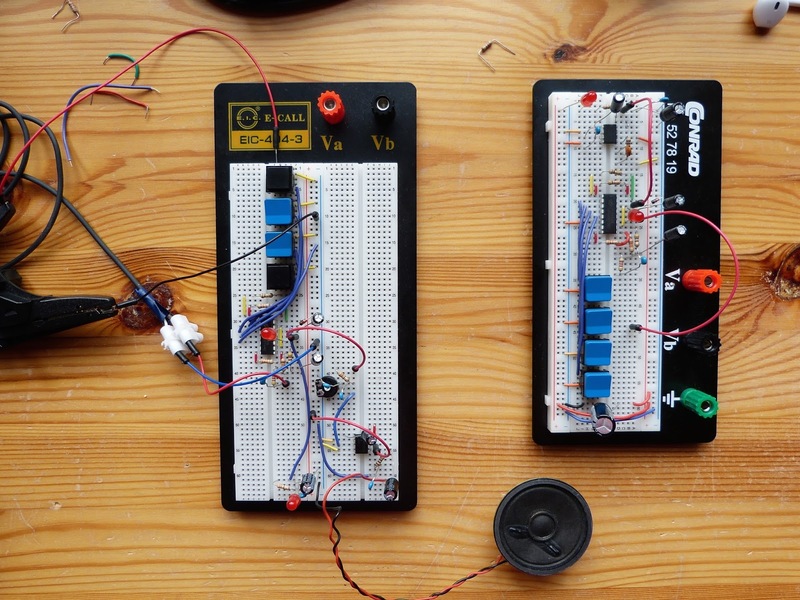 Two (almost identical circuits) with the Holtek HT8950A voice modulator and the LM386 amplifier. Both circuits gave a hiss which was unacceptable. Eventually a simple 10uF capacitor from pin 6 to ground did the trick for me. 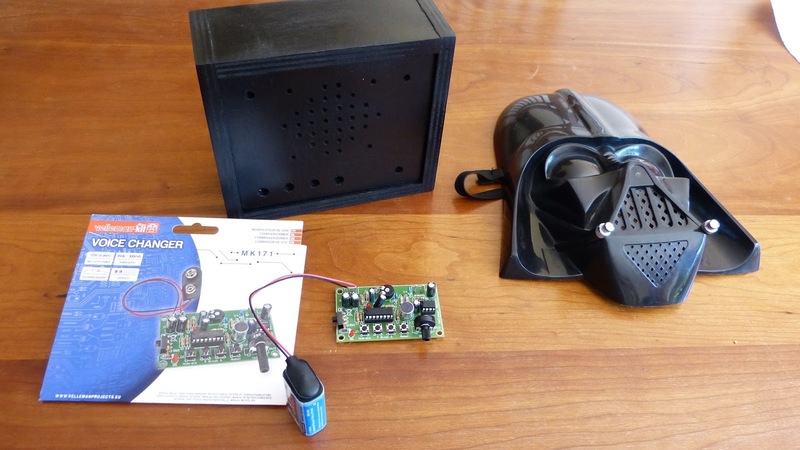 Schematics of the Darth Vader voice changer. I was able to eliminate all the hiss and noise from the LM386. 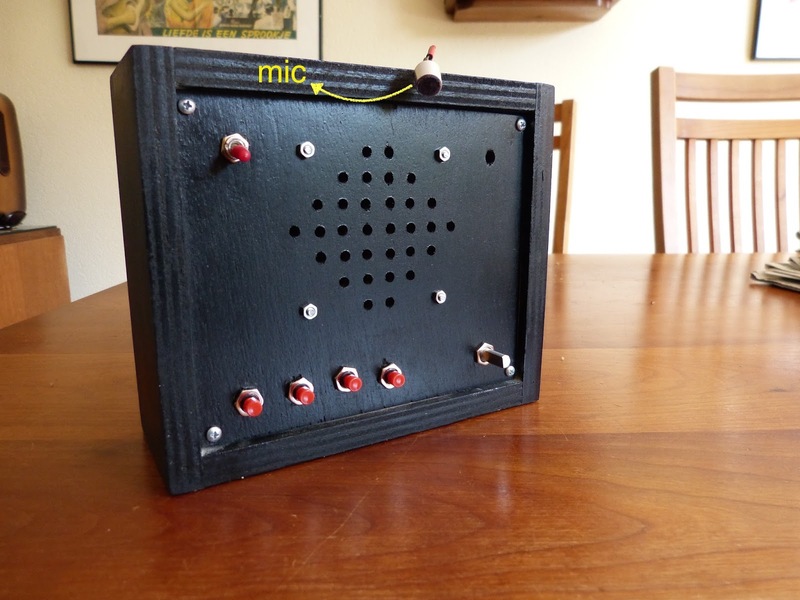 I decided previously to make a T-slot plywood case for the Voice Changer but I’m not satisfied with the result. First I made a beginners mistake with the tab width. It was chosen poorly resulting in fragile edges of the case. Also I discovered that a T-slot case is not the best choice for this project. The case needs to be sturdy and the T-slot isn’t. I’m afraid it will fall apart when in use. Therefore I’ll made a regular finger joint that will be glued together. This new case was much better. Gone are the fragile edges and I’m confident that glued together it will be very sturdy. 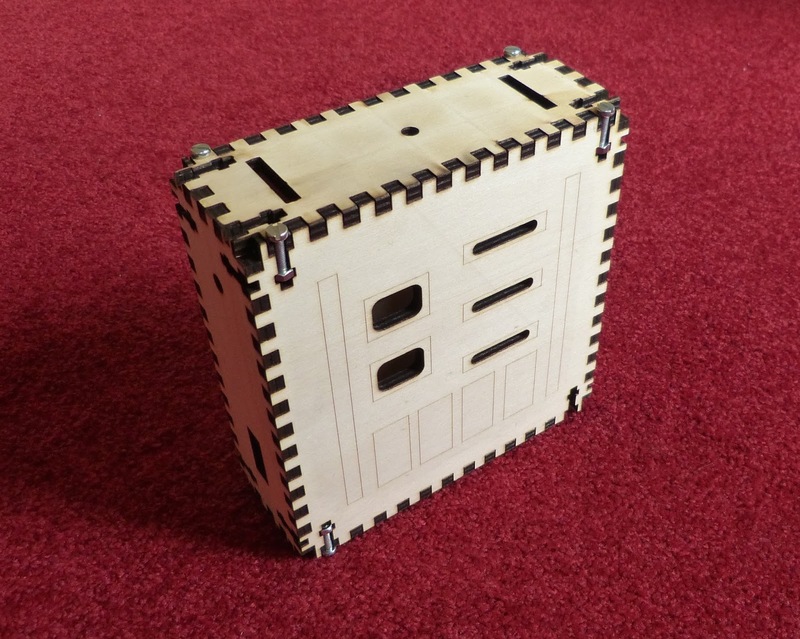 Laser cut case made out of plywood. I first used a T-slot type of case but made a beginners mistake with the tab width and positioning. As a consequence the edges become very fragile. The front of the case has engravings for the positioning of large controls of the voice changer. These controls on the front will we dummies just to mimic the look of a Darth Vader voice changer. The actual controls will be on the side of the box. 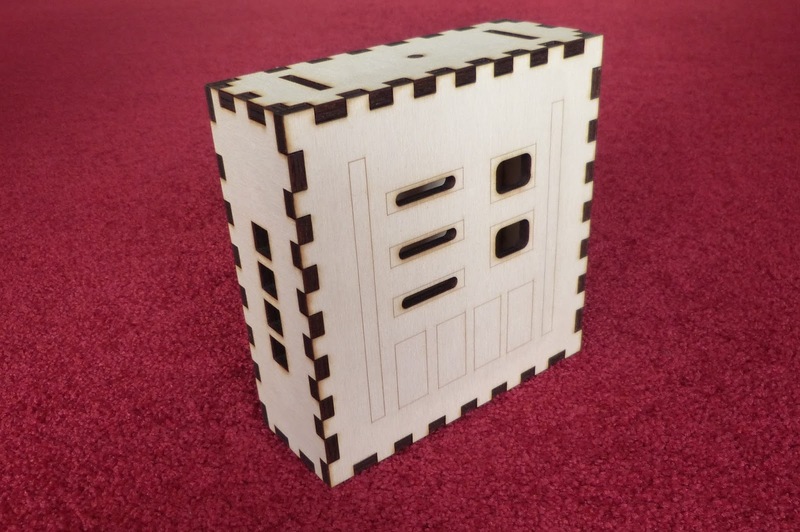 Laser cut case with regular finger joint. This attempt is much better. 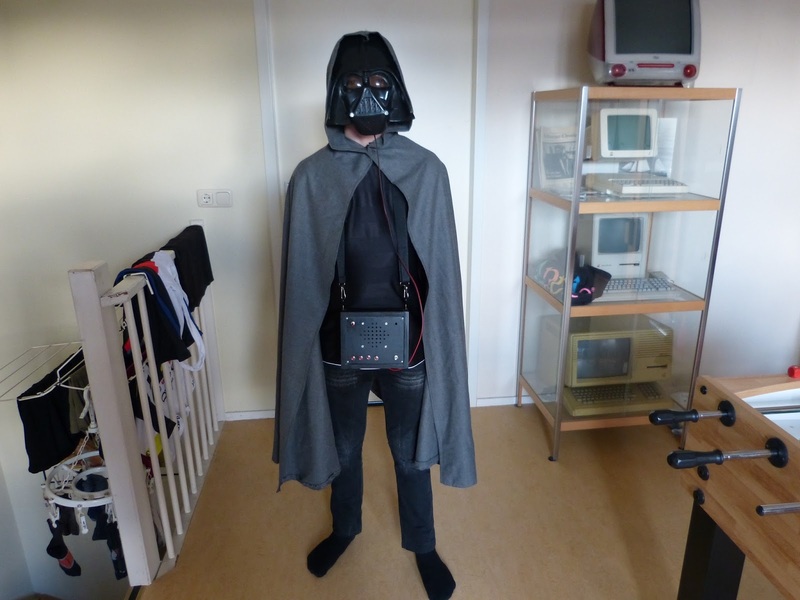 I finally finished the Darth Vader voice changer this weekend. I took a belt with two snap hooks from an old bag. Next I fitted the box with the voice changer with two black screw eyes that were large enough for the snap hooks. The enclosure is now comfortable around the neck of a child. 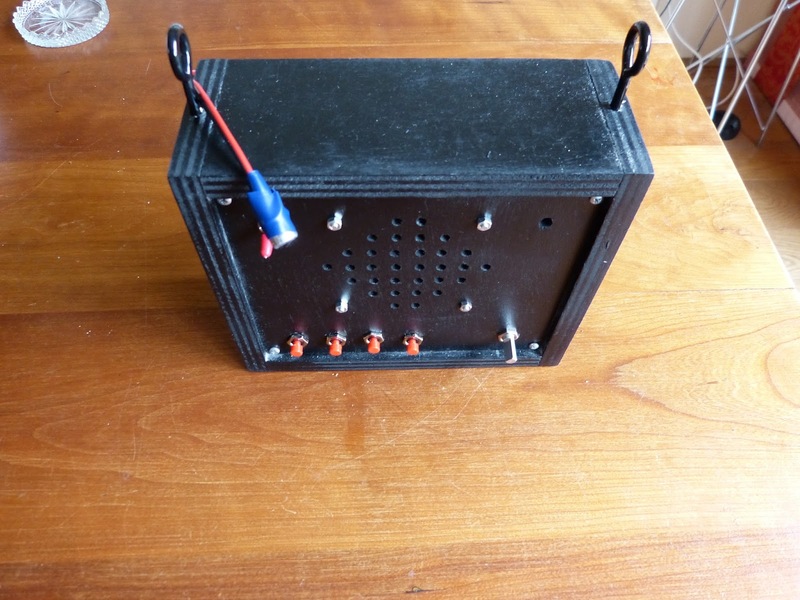 In a local electronics shop I bought a case for a 9V battery that fitted nicely in the box. Finally I taped the mic into the Darth Vader mask and the fun could begin. My two boys both volunteered and got dressed as Darth Vader. We still have a dark cloak that goes well with the mask. Unfortunately we sold the lightsabers a couple of years ago. The Darth Vader voice is surprisingly convincing but only if you play around with the settings. Even funnier, you can make Darth Vader sound like a robot or as someone that has just inhaled helium (a very high pitched voice). I can imagine children having a lot of fun with the voice changer at a party or at Halloween. Is there something left to be desired? Yes, the voice changer has four buttons for robot voice, vibrato, higher or lower pitch. As mentioned before I somehow couldn’t get the external red push buttons functioning that were placed on the enclosure. So I used the pushbuttons on the MK171 board instead. To access the four pushbuttons on the MK171 board I need to open the enclosure. This is far from ideal and something that needs to be fixed in my next version of the voice changer. Darth Vader complete with mask and cloak. Unfortunately the lightsaber is missing. 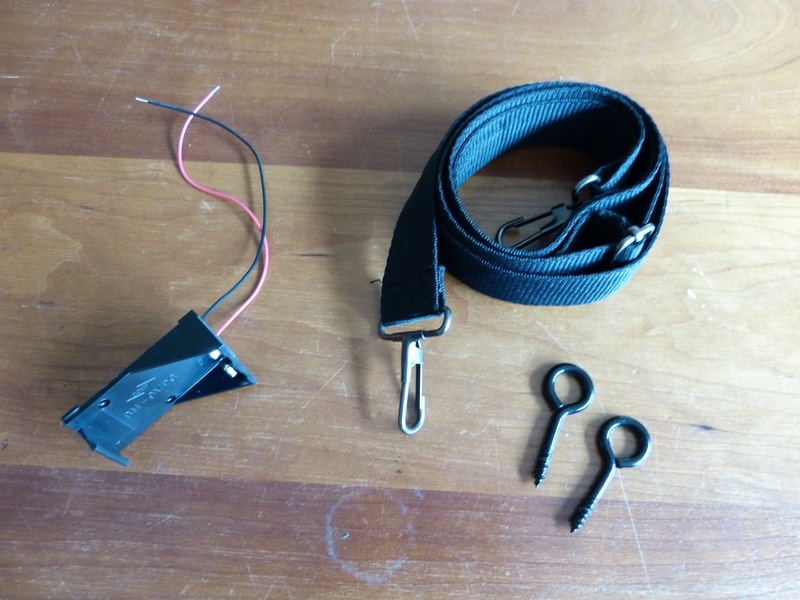 A Belt with two snap hooks, screw eyes and battery holder for a 9V battery complete the Darth Vader voice changer. Enclosure, now with screw eyes. 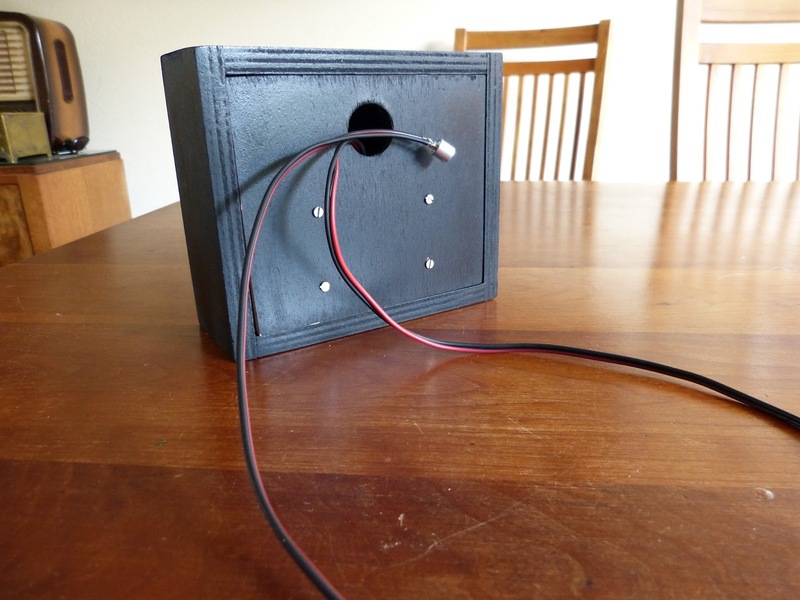 Inside of the enclosure with battery holder. 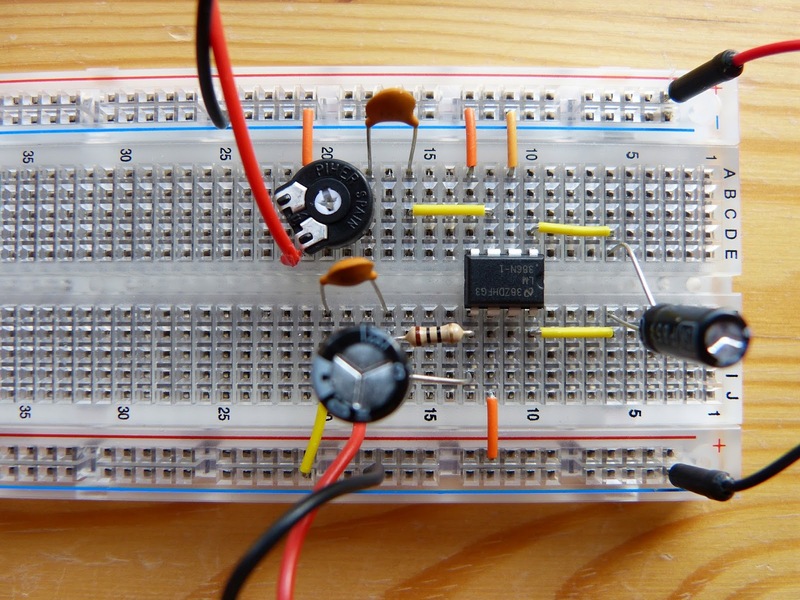 Begin this week I created a simple Audio Amplifier with the LM386 (see previous entry). I noted that there was some noise coming from the speakers. 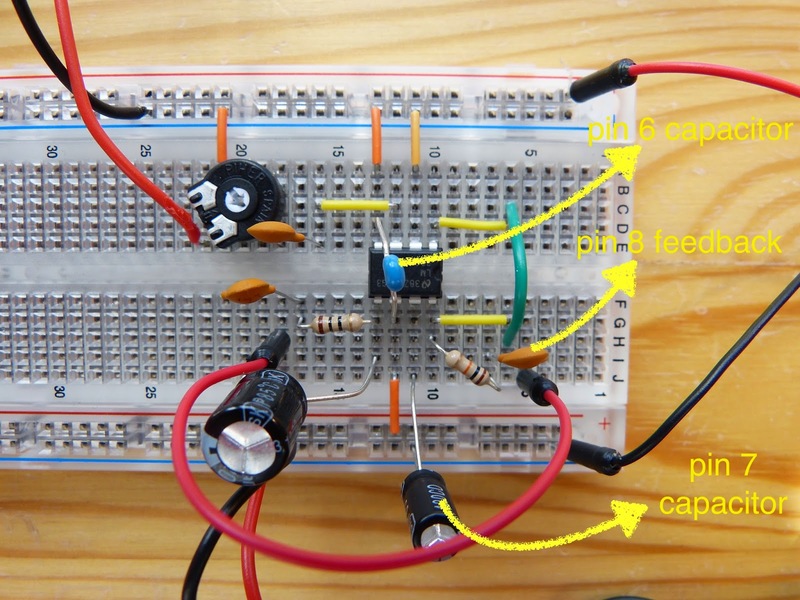 I already had a 100uF capacitor on the breadboard to smoothen the power fluctuations. 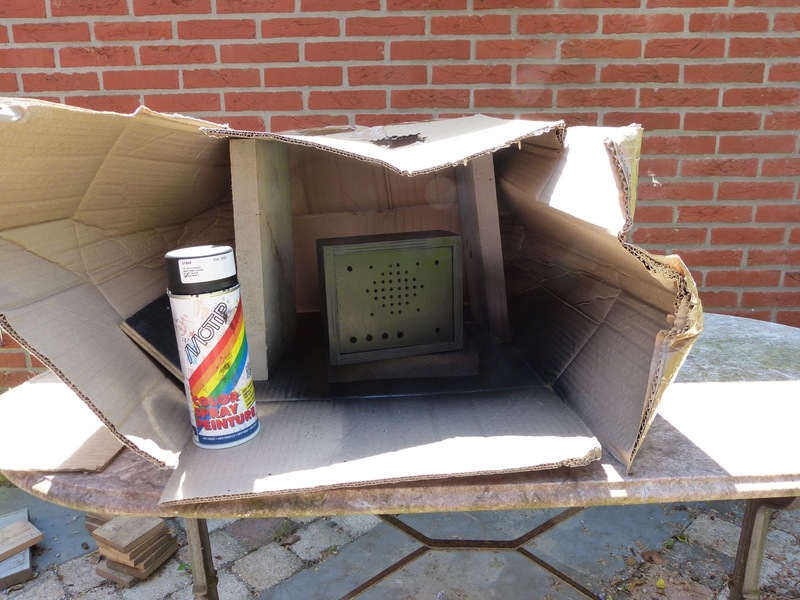 I searched the internet for solutions to further reduce the noise. I found three possible measures. Connect a 10uF to pin 7 of the LM386. In the schematics from HackaweekTV pin 7 (bypass) is not connected. On the website Learning About Electronics I found a tip to connect 10uF capacitor to this pin and ground it. Here is a link. On a another blog (Low Voltage. Mostly Harmless…) a 10nF capacitor is added to pin 6 and ground. Here is a link to this article. This is a feedback the LM386 output (pin 5) and pin 8. The feedback includes a 10k resistor and a 10nF capacitor in series. I found this tip here. I included the three measures one after the other on my breadboard and then played some music. I found the the 1st and 3rd measure had a significant audible effect. The 2nd remedy, the 100nF capacitor added to pin 6, didn’t have an audible effect. With the combined measures the noise was indeed reduced to a very acceptable level although it was not entirely gone. 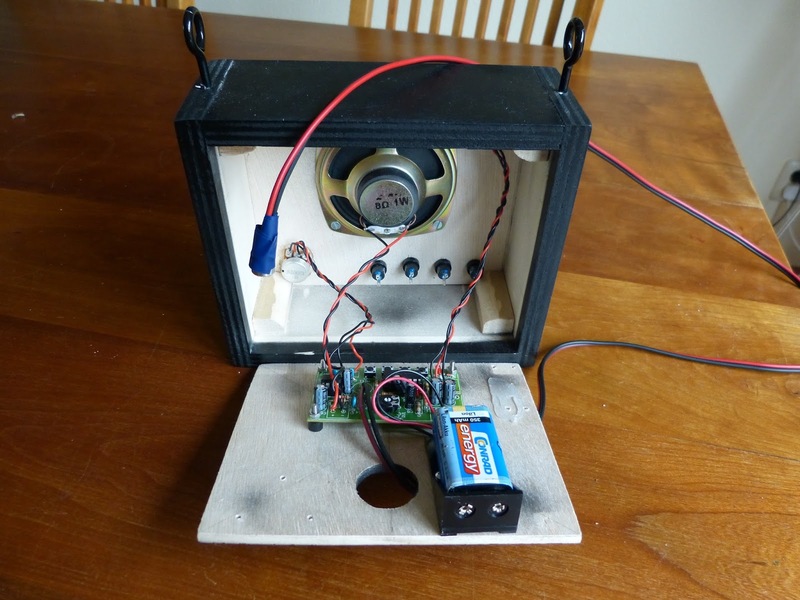 For a video that demonstrates the Audio Amplifier see below. Improved circuit with significantly reduced noise. The 10uF capacitor between pin1 and 8 is removed. I didn’t need the additional gain.